Can you slay the dragon in this "slot-builder" game? Count me in as someone looking forward to a Mac version. Love the aesthetic of this game - looking forward to trying it out! Well, maybe you could do a keyset based around I-J-K-L as the cardinal directions? Or maybe I-J-L-comma? And I think W-A-S-D could actually work if you make space be the pauser. You know, another option would be to just support screen clicks on the display. That would solve a lot of the issues for people using laptops. But I think it is quite an effort to implement it properly. Then, you could set a different keySet depending on the type of key bindings you want, and the behavior is abstracted away. Later, you could have a functionality that would let players define a custom keySet. Do you know if the rules of the 7DRL-Challenge allow me to update my game by additional controls after the deadline? There's another thread in the 7DRL forums about this you can read for more detail, but the short version is that it's okay to update the game as long as it's clear and feasible how the 7DRL reviewers can play the end-of-compo release version. So you could update it, but be sure to leave the original release version up and clearly marked for reviewers. This is a fantastically fun idea for a roguelike. I haven't internalized the Vim keys and I'm playing on a laptop, so I don't have a numpad, so it would be really helpful to be able to just remap the keys, but even with my clumsy Vim-key playing, it was pretty fun and compelling. Great job! Maybe it was that level, but if so, the stairs didn’t spawn after I killed it. There was only one enemy on the level, and I *think* it was black, not red, and I don’t recall seeing any flames, although it spawned right next to me so it wouldn’t have been able to leave a trail. I killed it immediately, and there were no stairs afterwards. Spent quite a while just wandering around the empty level, standing on every tile, bumping against the walls, wondering if there was a secret thing needed to advance. Pretty sure it was a bug, since an error message was emitted to the console. Did you have support from your spouse/partner or was it a selfish labor of love? Are you feeling burnt out or inspired to continue working on your entry? One technical challenge I put myself to was to make my roguelike screen reader friendly, so that I could apply what I learned in my day job. So, yes, I think it's safe to say I'm going to continue working on at least the technology behind my entry. As for the entry itself, yes, I'd like to flesh it out even more – due to the ER visit, I had several plans for features that didn't make it in, and of course it needs some tighter balancing. Are you disappointed by anything? The main thing I'm disappointed by is the fact that I didn't get some actual drawn art in for the cards in the game. I was hoping to spend the last day or two of the 7DRL drawing some cool cards, since the card combat is a big part of the game. Instead, I just have round rects with only words on them. It works, but it's not nearly as satisfying as what I envisioned. Are you happy with feedback received? Well, so far people seem to like it, which is always gratifying, but what I was really hoping to get was some feedback on the manner in which I structured the game to work with screen readers from a person who regularly uses a screen reader other than VoiceOver, which is the screen reader I did my own testing with. I have no idea whether what I did was useful, pleasant, workable, or desirable for people who primarily use screen readers, and I was hoping to get some feedback on that side of things. In testing with VoiceOver, the game feels very playable, but not being a screen reader user normally myself, I don't know what I'd be missing or failing to consider. Hopefully, it's perfect and people like it. But if not, I can't fix it until I hear what I got wrong. Despite some unexpected medical drama with family members, I managed to finish my game Battle Weary, which is a deckbuilder roguelike that was designed from the ground up to be screenreader friendly. Your character is your deck of cards. You start the game by drawing a hand of four cards. When you encounter an enemy, you can play as many cards out of your hand as you want (attack, defend, and other types of cards) and then discard the rest. Then it is the enemy's turn to play a card. Then you draw another hand of four cards, and the battle continues. When the enemy manages to hit you, you take a Wound card. And every time you reshuffle your deck to get a new draw pile, you shuffle in an Exhaustion card. If you ever draw a full hand of "deadly" cards like Wounds and Exhaustions, then your hero has fallen and it's game over. Over time, you can build up your deck to be more powerful by buying new cards from the trainer, the blacksmith, etc., which allows you to delve further and further into the dark forest before having to return to town to get healed (to remove Wound cards) or rest at the inn (to remove Exhaustion) cards. The game is written in HTML5, and I set myself the challenge of making it screen reader friendly. It turns out that there's not a lot of information out there on the internet about making web games work well with screen readers; the closest thing I could find was how to make web applications work, but most of that was in the context of making, essentially, web forms navigable. So I ended up having to do a lot of experimentation and testing, but I eventually got a "Hello World" app working with VoiceOver, and I was able to apply that to Battle Weary as I developed it. But the technology for making an interactive game wasn't the main hurdle; it was trying to adjust the gameplay of a traditional roguelike to make it understandable and enjoyable when used with a screen reader. For instance, having to listen to something like "There is a snake four tiles west and two tiles north, there is a door six tiles east and seven tiles south, etc." every time you take a step to understand the environment would get tedious quickly. So I changed the game's movement to be room-by-room instead of tile-by-tile, a'la Telengard. 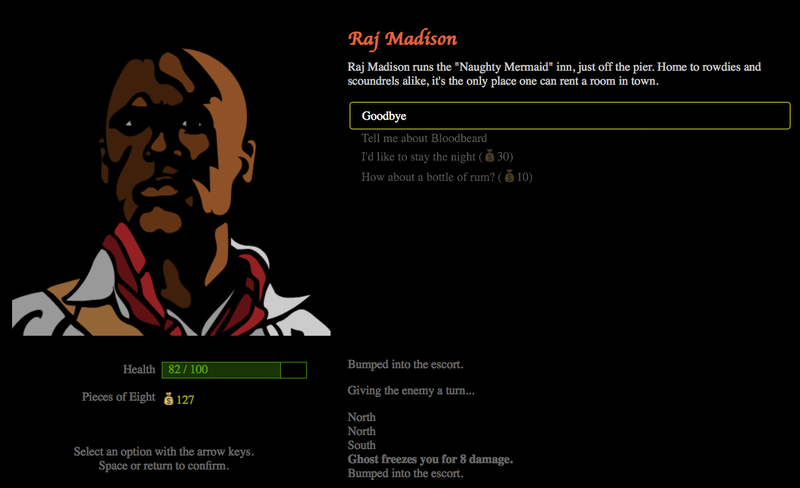 That preserved the basic gameplay of roguelikes while making it easier to describe the player's situation in text. Overall, I feel the game turned out pretty well considering the challenges I had. I haven't gotten any feedback from anyone who regularly uses screen readers yet, but I'm hoping that the manner in which I exposed the gameplay works well in practice. If you have access to a screen reader (particularly one other than VoiceOver) and are willing to test the game with it, I'd love to hear how it goes. Nice game! I really like the word building mechanic - very clever. Got stuck on level five when it generated a level with no stairs. Fought one ghost and then was stuck. In the web console I got the error message "ReferenceError: Can't find variable: monster" on line 112 of world.js. Nice. I think it's a good start. It's not super fun to play right now, but I can see the potential if you can flesh it out with some of the features you mention in your article. Make the map scrollable/zoomable so you can get an idea where everything is. As a new visitor to the land, when I'm asked to go to a certain place, I don't know where that is, so I have no idea even what direction to head. That made the game frustrating. When there's a "lead", put an icon on the map at that location so I can understand where I'm supposed to be going. I would put more leads in closer proximity rather than having fewer leads spread out all over creation. Sometimes, I should be choosing between multiple leads to follow rather than only having one thing to do in each town. Given the "Epic" focus of your game, maybe what you could do is remove the numeric combat system entirely and replace it with a narrative one. I.e., instead of having some numerically-driven simplistic system, you define combat vignettes that are story based. Do you allow that NPC to get killed, or do you take a wound yourself? Do you charge the archer or run for cover? Etc. If you rolled this into a more generic encounter vignette system, it could work with your resource management stuff, too – as you go through these vignettes, you gain and lose arbitrary traits, which can influence the availability of different options in later vignettes. Nice. Beat the wizard with 2242. Fun mechanic - definitely worth playing! ZOME community · Posted in No updates in a while. Any plans to continue development? I'd never heard of Electron before. Looks interesting. ZOME community · Created a new topic No updates in a while. Any plans to continue development? Just checking in to see if there are any plans for continued development of ZOME...? ZOME community · Posted in Any progress? Cool. Looking forward to seeing this develop. ZOME community · Created a new topic Any progress? Just wondering whether there is any progress on Zome. You had mentioned some features you were hoping to add which sounded pretty useful! * First of all, I like the new features! The fill mode and eyedropper are really handy. Definitely solid quality-of-life improvements there. * It would be nice if we could have a way to do each command that doesn't involve right-clicking. Right-clicking is kind of a pain on a Mac and/or on a laptop. (What I'd really prefer is the Photoshop "I" key command to eyedrop.) Alternatively, a way to remap key bindings. * I encountered a slight weirdness where I couldn't click on the same tile I just changed to change it to a different tile. For instance, if I'd select tile type "A" and click at tile (2,2), then go over and select tile type "B", and go back to click at tile (2,2), it wouldn't change to tile type "B". If I go to any other location on the map, like at (3,3), and click there, it would change as expected, and if I then went back to (2,2) and clicked again after clicking somewhere else, it would also change. It just seems to happen to the last tile you changed. Not a huge deal, but it bit me a few times, and I suspect it's a simple fix. * When I go fullscreen, it letterboxes with white (or maybe a light gray), which makes it hard to focus on the map content. I think I would definitely prefer black or a dark gray color, if you have control over that. Or better yet, extend the map and tileset panels to fit the screen so that there's no letterboxing. Anyway, nice update! I don't think I could use this in production until we get layers and/or metadata support, but it's sure pleasant to draw maps in already. ZOME community · Replied to 01010111 in Nice. Some suggestions. Since you've already got JSON saving/loading in place, I'll bet you could just bump off a JSON save to a stack of strings after every edit, and when you hit undo, pull that string from the stack and load it. You're already got the hard part done - serializing the map data. ZOME community · Created a new topic Nice. Some suggestions. Gave ZOME a test drive, and it's pretty slick and easy to use. Omits a lot of the cruft that many editors like this bring. I particularly like the way you accommodate resizing the map - very clever, clean, and intuitive. * A "fill" feature would be nice. * Like you said in your page, layers are kind of needed. * Some way to associate metadata with locations in the map. Things like entrance locations, exits, npc's, etc. The way Tiled handles it is that you can add dictionaries of key/value pairs as "objects" to location, which is really powerful, but if it were just associating numbers with tiles (like sticking a little "12" in the upper left corner of a tile when the number 12 is associated with it), that would be enough for a lot of purposes, since you could map those numbers to external things elsewhere. * Some way to associate metadata with the map itself would be nice, too. * The first tileset I imported was my tileset from Arkham After Midnight, which is a 512x512 tileset with 16x16 tiles. It was far too small to work with the tile selector on the right. You might consider letting the user zoom the tileset like you allow them to zoom the map. * I noticed that the tileset selector area was vertical, so I tried making a quick custom tileset that was 256x512, which was definitely more usable, but the UI cuts off the tileset view at about the 21st row instead of showing all of it, even though there is plenty of room. (I'm guessing you're expecting only square tilesets?) You might consider letting that entire right pane be filled with the tileset. * I'd like to see menu commands for things like save and load instead of just keyboard commands. * Undo/redo support would be nice. Anyway, a nice editor. I could see using it for quick one-offs, or games with simple tile needs. I'd love to see it get developed a little further to add metadata and other amenities; I'd love to be able to use something like this for Arkham After Midnight and similar projects. Thanks for including it, Jupiter. I've been following your video series for a while, so it's a treat to see it featured there. Sorry you got killed by a sand worm so quickly! 7DRL Challenge 2018 community » Community Discussion · Replied to Darren Grey in Policy for submitting updates after deadline? Sounds good. Thanks. I've included the original 7DRL release in the page as well as updates. The updates I've done so far have all been minor bug fixes and pretty slight balance and/or help documentation tweaks, so I don't feel like I've broken the spirit of the competition entry with updates yet; they're still almost identical, so someone playing the game in the web page is basically getting the same thing that was released with only minor fixes. 7DRL Challenge 2018 community » Community Discussion · Replied to Vedor in Policy for submitting updates after deadline? 7DRL Challenge 2018 community » Community Discussion · Replied to potatomancer in Policy for submitting updates after deadline? I was wary of doing that since my game is an HTML5 game, and I saw no way to select between versions for the browser. But I see that I can put it up as a downloadable file, so I'll go that route. 7DRL Challenge 2018 community » Community Discussion · Created a new topic Policy for submitting updates after deadline? So I imagine many of us have bug fixes or other things they want to change after the deadline has passed. What's the policy for this in relation to the judging? Ideally, there would be a way to "freeze" the submitted version for judges to look at while still letting us add bug fixes for people who are just here to try out our games. But I don't see a way to do that using itch.io's system. Would it be sufficient to go ahead and update our games, and just note in the description page what we've changed since the jam ended? Hi. My 7DRL submission this year is Piratical, a fairly traditional roguelike with some fun little experiments. You play as a pirate attempting to defeat the dread Captain Bloodbeard, a black-hearted cur who made a deal with dark powers to become one of the most feared pirates to set sail out of Barataria Bay. Join forces with Madame Sarita, the voodoo priestess, to find Bloodbeard's phylacteries. Destroy them to make him mortal, and then defeat him with cunning and a little magic of your own! 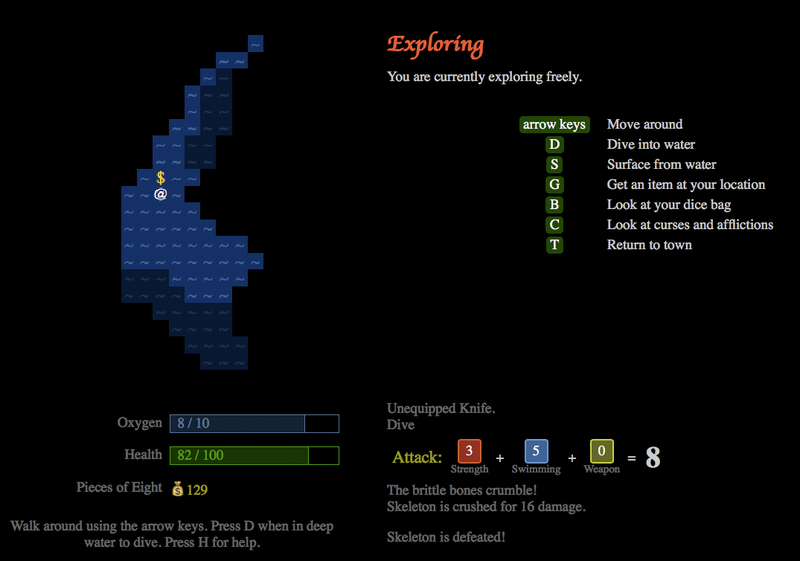 Have some solid, laptop-friendly roguelike fun. The game plays nicely in the web browser, uses orthogonal movement (to ease the pain of laptop users), and sports some nice, colored environments. A fun theme. Pirates are fun, right? I tried to reinforce the theme with several mechanics, like being able to lop off a hand and replace it with a hook, having voodoo curses, sunken galleons, treasure maps, etc. Expanding how maps work a little. In Piratical, levels are two-tiered: above water and below water. You can dive down to the underwater level and surface up to the above water level, which makes for some interesting mapping mechanics. Make it approachable. I tried to get instructions on the screen at all times to help with onboarding, and I tried to get some quality-of-life features in place like the compass and quick-keys for changing the equipped weapon. Levels with distinct feels to them, so that not all levels feel the same. I think I accomplished this, although I was hoping to get a few more in there. There are swampy bayous, labyrinthine sea caves, sunken galleons, and beaches. Game progression. As you delve further into your adventure, you will encounter things that are tough, and you will need to figure out the capability to respond to them. The mechanisms in the game are simple, but they reinforce the theme, so I'm happy with them. Approachable challenge. The game will probably kill you a few times while you get your "sea legs", but once you have some experience, you should be able to win the game without spending months attempting it. The RNG is generally pretty forgiving; most deaths are avoidable. Overall, I'm happy with how it turned out. I'd like to spend some time cleaning up the codebase and doing some things in a more "proper" way, and adding more content. But for now, I'm happy with where it stands for a seven day effort. It's possible that there's a bug in the mystery generator that generates a "dead end" mystery, but I've played through the game to the end many, many times, so my impression is that it would be rare occurrence even if there is such a bug. You probably should not be experiencing this multiple times in a row. More likely, there's just some clue or hook you're missing. Be sure to search all the crypts, read all the books in the library (the "?" icons), talk to all the people, etc. Also, note that some locations may be injected into the list of locations when you find things, so be sure to check and re-check your locations. There are also items that show up in your inventory that might yield clues. Yes, that's a known bug. The version that is currently up is the "compo" version, which was frozen at the end of the competition for judging. I am working on a new version that will (hopefully!) fix the bugs and introduce more content. This is a nice little clicker. Seems to have quite a bit of charm. But boy is it stingy with the advancement! I'd recommend ramping up the cost of plants much less slowly, or better yet, letting the player ramp up $/sec or $/click much faster, as that would probably feel more satisfying. As it stands, it got very dull very fast, with way too many clicks required to plant a plant. Unless you intend this to be one of those "walk away from it and come back later" type clickers, it would help to reduce the aggressiveness of those curves. It really needs a save game feature (especially if it's going to be a "walk away and come back" type game). The keyboard support is a nice feature. Pressing space bar on a laptop is much preferable to clicking a trackpad. I'd like it if I didn't have to click on what I wanted the space bar to do each time - perhaps you can instead have keyboard shortcuts for calling up the menu or doing other things? Paisley Princess community · Created a new topic Nice! Love the minimalistic aesthetic for this game. It ended too soon! * Needs some kind of visual response when you lose health, since there's a distinction between your core and your jelly. Screen shake, flashing the screen red, or something like that would help. * The first time I played, I appeared in a room in the upper right corner that had no exits. It looks like the level generator tried to create a corridor going south out of the room, because it had two columns of "#" characters leading away from it, but there was no space between them to move my jelly down. * Cosmetically, it might be fun to let you choose the color of your jelly. And some squishing noises as you move might be satisfying, too. Fun little game - really enjoyed it. * Something other than the color-tinting for the time-of-day. I'd like to see the stars come out, the moon go up and down with the sun, etc. (Maybe you could do one of those "sun/moon" dials like you see on grandfather clocks in the background.) The town should grow dark, but the lights in the buildings should glow. The throne room could grow dark, but still have light thrown by torches. Etc. * The lifeblood of this game, I think, is the set of decisions that have longer-term effects than just that one decision point. Recurring characters, town improvements, quests, etc., are what felt the most compelling about the game. You should add more of those. * For replayability, I think you should have some of those decision choices be "branching", in the sense that if you, say, hire the witch, then some other character leaves town, and if you do not, that character stays and has its own effects. That would give you different characters on subsequent playthroughs, and also introduce an interesting meta-game where people try to decide where they want their kingdom to go based on the effects of the characters. * The people walking in and out so slowly gets a little tedious. Maybe speed that up a bit? And perhaps start the next person walking in when the previous person is leaving instead of having one person leave completely before the next person starts walking in. * It would be nice for the king to be animated, giving thumbs-up and thumbs-down as part of the answer, or maybe nodding and shaking his head. * I liked how the town was built up in the background over the early game, but it very quickly became static. Maybe just ramp that animation over a longer period of time? Or better yet, find a way to integrate the granaries, the gardens, etc., into the view of the town. Anyway, that was a really fun little romp. Interesting how just yes/no questions led to some compelling gameplay. When you press the "No" button, the animation plays for the "Yes" button. Thanks for reporting this! I've uploaded a build that should fix that issue. Should be fixed now! Thanks for letting me know. Thanks for the issue report. I'll look into this. I'm planning to release a new version of "No Crypto" here in the coming days that should address a bunch of bugs and include several new features. Wow, sorry about that. Thanks for reporting this; I'll see if I can figure out what's up. I'm pretty sure it's platform-specific, since I've had the game running for many hours at a time in browser tabs without a crash on my development machine, so it might take some time to track it down. If you notice a pattern or see any error messages that might shed light on what's causing it, let me know. Thanks! No Crypto For Old Men 7DRL community · Replied to TakeNapEveryday in Space and Backspace keys being sent to the browser. Nice. Thanks for helping me troubleshoot this. All right. Okay. I know I have said this before. But I have uploaded a new build that should address these keyboard issues in FireFox. Sorry for the trouble.